ORLANDO, Fla., Nov. 19, 2018 /PRNewswire/ -- OUTFRONT Media Inc. (NYSE: OUT) today announced a campaign designed by its in-house creative studio OUTFRONT Studios for the Florida's Space Coast Office of Tourism, featuring one of the largest three-dimensional displays in an out-of-home campaign. Orlando commuters traveling East on Interstate 4 can see three creatives on OUTFRONT's trivision billboards boasting Florida's Space Coast's diverse assets as a destination. The out-of-this-world design was created by OUTFRONT Studios and built by Imagine It 3D. The three-dimensional, 30 foot tall rocket highlights three different favorited tourist draws on one billboard. 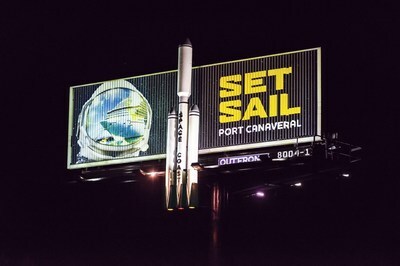 Cocoa Beach, Port Canaveral and Signature Rocket Launches are displayed as the billboard spins to showcase one of the three interests every 7 seconds. "Just like our unique and diverse destination, we wanted to create a statement-making piece that visitors could see and immediately think of Florida's Space Coast," said Tiffany Minton, Marketing Director for Florida's Space Coast. "By partnering with OUTFRONT on this one-of-its-kind billboard, we were able to build a landmark and inspire passerbys to discover our local destinations." Out-of-home advertising has continuously proven itself to be an invaluable, cost-effective medium for brands to reach their targeted audience while they're out living their lives. This particular installation offers an eye-catching experience that creates a memorable brand touchpoint for Florida's Space Coast. "We were excited to partner with Florida's Space Coast to create a larger-than-life design that brought their visions and goals to life and captured the public's attention," said Eddy Herty, National Creative Director at OUTFRONT Media. "With three different creatives and a 30-foot-tall rocket, we captured the essence of Florida's Space Coast and now people can experience part of the destination in their everyday lives." By utilizing an innovative network spanning the United States, OUTFRONT Studios delivers groundbreaking campaigns that are impactful and engaging. The first-of-its-kind within the out-of-home space, Studios focuses on producing original creative for use on its out-of-home network.